18th C, Elm. Chair distinguished by rectangular spiral pattern (‘guaizhi’), wide seat, auspicious carvings meant for officials; excellent condition. The form of these chairs is distinguished by its arms and back-splat constructed in a rectangular spiral pattern known as “guaizhi”. Central to the splat a rectangular panel is carved in relief in two sections, a flying bat at the top signifying abundance, long life and happiness, and below this panel a bat holding in its mouth a ruyi-shaped banner dangling over a ruyi motif, meaning “grant all wishes”. A recessed apron below has a beaded edge and floriate design with a cusp in the middle. The top of the backrest is slightly arched back for head comfort. The back of each backrest has the Chinese characters meaning “eternal peace” written in the middle of the splat. Each chair has an extra wide flushed hard seat on which the open-rail back and arm panels are anchored by mortise-and tenon method to wooden bars below the seat. This method of construction prevents the parts from twisting out of alignment over time. Another wood bar traverse the middle of the seat underneath, further strengthening the chair. The chair has a narrow waist from which an all-around beaded apron arches out to join four “sword ridge” molded stretchers, before ended on feet incised with a scroll pattern. The middle of each apron has a beaded archaic cloud-scroll design signifying a wish for many blessings to rain down from heaven, a design evolved during the Qing period. This pair of chairs is in excellent condition. It has retained its original thick dark lacquer coating, which has become finely crackled with age on some surfaces, giving them a crusty leathery look that gives the chair character. 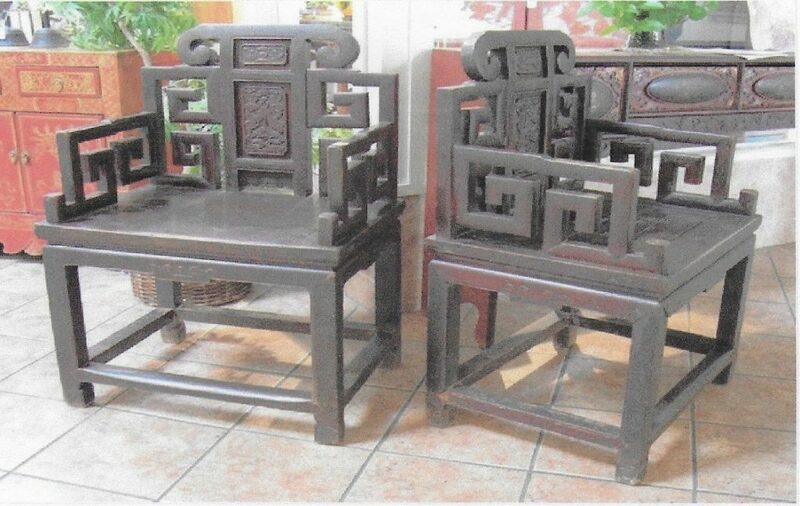 These chairs, with “guaizhi” rail, slightly tilted crest-rail and extra wide seat for the comfort of the sitter, likely mean they were made for someone of high status.